Five years ago, I sailed to a 96-acre island dominated by hundreds of thousands of seabirds. The biodiversity was incredible and I was quickly captivated by these pelagic creatures that had come together in droves to breed on a hunk of rock off of California's coast. Since then, I have been involved in seabird research throughout the North Pacific and Bering Sea. The majority of these projects were collaborative studies of seabird foraging ecology and long-term population dynamics. 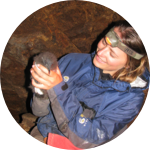 My experiences culminated in my current pursuit of a PhD degree and my focus on threatened albatrosses of the Southern Ocean, where I hope to gain a better understanding of how these birds interact with their environment and their energetic requirements. A central question that I will address throughout my career is: How adaptable are seabirds (physiologically and behaviorally) in view of climate driven changes and human exploitation of resources? And secondarily: What species are more susceptible to change and in need of dedicated management efforts? Thank you, Herma! Your support is much appreciated! Haha, of course! But you might have to wait a few years. Thanks, UM for helping out! Love you! Hi Oscar - thank you for your donation! Albatrosses are generally pretty mellow and approachable - some species more so than others. I've had birds walk right up to me and "greet" me just as they do with other birds and I've even had a bird carrying a GPS device on her back land right in my lap when she returned home from sea. They are pretty goofy! That said, some individuals can get very nervous and I do my best to avoid working with or near those birds. Thank you, Sandra! I'm so grateful that you have contributed to making my research possible! You are amazing as well! Love you too, cousin! <3 That's such a wonderful thing to hear - I hope I keep making you proud! Thank you for your support! Thanks, Dev! You just put a huge smile on my face! Glad you are a part of making it happen! Thank you, Cindy! They are pretty amazing! Thank you for your support, Beth! And thanks for all the hard work you do in Hawaii! Thank you, Renee! I'm so excited to discover more about these birds!